Feeling a warm glow wash across your face as the sun crescendos over nearby mountains is the best way to start any morning on vacation. If your feet are also propped up on a lake-side balcony, you’re just earning bonus points. But on a trip to Penticton, a BC gem with dozens of area wineries and an up-and-coming culinary scene, soaking up some vitamin D before breakfast is just the beginning. There’s also a vast network of trails to consider. At Expedia.ca, we think the key to kick-starting your trip to Penticton is finding the best home away from home (AKA the hotel of your dreams). From there, you’re perfectly poised to cycle local trails. 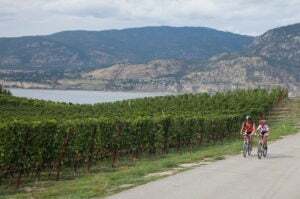 Here are the best ways to stay, cycle and eat in Penticton. It’s not hard to see why the translation of the First Nations’ Penticton is “a place to stay forever.” Shack up at the Cormier Studio B&B, and you’ll be charmed by the hotel’s hillside location and views of Okanagan Lake. The garden suite has a yard where you can store bikes or sip on a glass of local wine. Speaking of fermented goodness, the E’Laysa Guesthouse and Vineyard Retreat is the ideal place to stay if you’re seeking respite with a side of merlot (mountain views are included in the price). When you’re not biking vineyard trails, you’ll be swaying in a hammock. For a truly one-of-a-kind experience, book a yurt at the Barefoot Beach Resort at Skaha Lake. All accommodations are ground-level, so bike storage is easy, and you’ll love cool-down walks in the property’s colourful gardens. Penticton is a cycle-friendly city, no matter your skill level. You certainly don’t have to be black diamond level pro to have some fun on your two-wheeled chariot. Many local restaurants and stores make it easy to store your bike while you’re a patron, so cycling is a popular form of everyday transportation. If you want to get off the main thoroughfares, though, the following bike trails offer varying challenges and some pretty stellar scenery. The Three Blind Mice area has a complex network of trails set between pine rock bluffs and forestry. Follow signs carefully, or leave a trail of breadcrumbs so you don’t get lost. One of the primary routes will take you 10 km along the Reservoir Route Trail and beyond, ultimately ending in a 600 m elevation drop on the final stretch. The lake views offered by Three Blind Mice are rivaled by the Kettle Valley Railway trails. These are on an abandoned railway bed, but despite the easy grades, the trails also feature white-knuckle routes over railroad trestles and unique stretches of tunnel terrain. If you want to take the high road, so to speak, take your wheels to the Campbell Mountain Loop. Beginning at Greyback Mountain Road, the trail leads to a picnic table overlooking Penticton and Okanagan Lake and the option of climbing all the way to the summit. On the Test of Humanity, a volunteer-built loop that spans 10 km, you’ll encounter lots of peaks and valleys. You can really pick up steam on the downhill portions of the track. Yes,we mentioned that you don’t have to be a black diamond cyclist to ride in Penticton, but if you happen to be, then Rock Oven is your jam. The terrain is filled with rocks, swampland and challenging switchbacks—a perfect place to earn (or show off) your stripes as an impressive cyclist. Now that you’ve conquered a new trail, there is only one thing to do: refuel. Head for Bad Tattoo Brewing Company or the Cannery Brewing restaurants. Sink your teeth into a pizza and swig some peach cream ale or hearty stout as you compare bruises and trade tales with fellow cyclists. If you want to keep the scenic views coming, pull up a chair at the Okanagan Crush Pad Winery and savour a glass of craft wine. After an early morning cycle, go to The Bench Market for brunch. Specialty eggs Benedict and Belgian waffles with fresh fruit are just a few of your culinary options. Have we convinced you to turn up in Penticton for the cycle trip of a lifetime? Written by the Expedia.ca editorial team.